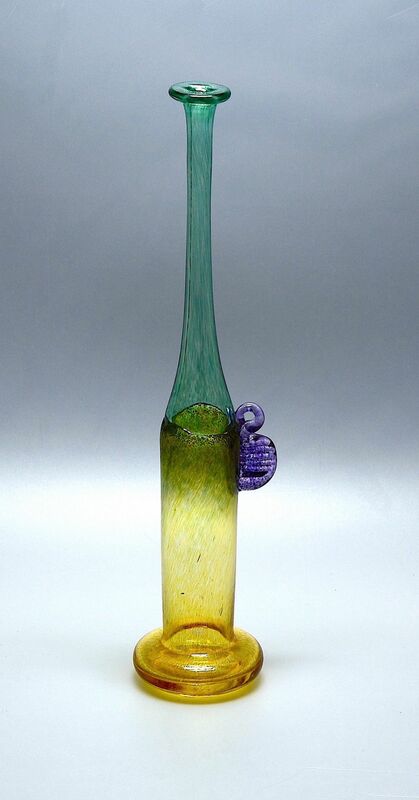 This whimsical attenuated bottle was made by Kosta Boda the Swedish glass studio and almost certainly designed by Bertil Valien. The bulbous base leads to the main body of the bottle and is in mottled amber with mottled green flecks in the top part where the body forms a textured collar to the green shoulders and long neck . On one side of the bottle is a mottled purple ridged and scrolling applied glass section that has always seemed to me to be an abstract creature - I will leave it to your imagination to decide the type of creature!